Two Croatians advance to 2017 Wimbledon finals! 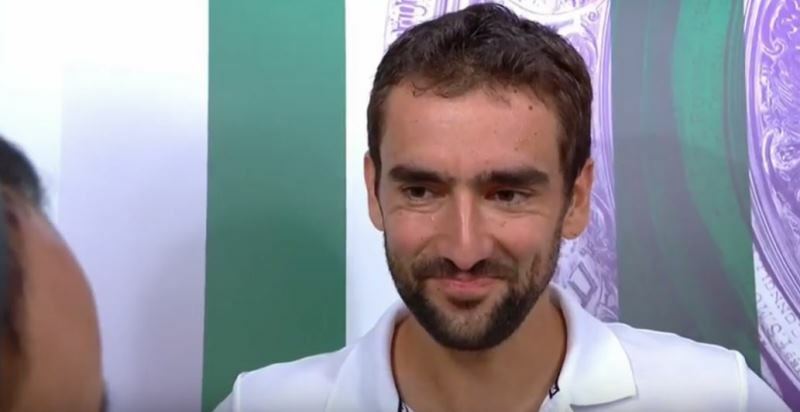 WIMBLEDON, England - Marin Cilic of Croatia will play for his second Grand Slam title on Sunday after beating 24th seed Sam Querrey 6-7 (6), 6-4, 7-6 (3), 7-5 in the Wimbledon semifinals on Friday. The seventh-seeded Cilic, who won his lone Grand Slam title at the 2014 U.S. Open, screamed in delight when he broke QuerreyĂ˘s serve in the 12th game of the fourth set to set up his first Wimbledon final. "I would say my mental toughness was on an extremely high level, considering that both of us played amazing tennis in the first set," Cilic said. "The level was absolutely unbelievable from both ends. Then just to come short in that tiebreak, I was 4-1 up, and Sam made a few good points. I was a little bit unlucky on a few challenges. Lost that set. ... But I managed to regroup and felt that mentally in the critical situations." Cilic, playing at his 11th Wimbledon, now tops the list of men who needed the most attempts to reach a Wimbledon final in the Open Era. Cilic will play third-seeded Roger Federer in Sunday's final. Federer, who beat Tomas Berdych in straight sets, has a 6-1 winning edge over Cilic. "I believe this is his home court, place where he feels the best and knows that he can play the best game," Cilic said of Federer. "Obviously I'm going to look back, as well, 12 months ago I was one point away from winning a match over here against him. Definitely I believe that if I'm going to be playing him, in my own abilities to get through and to win it. But I still know that it's a big mountain to climb. Roger is playing maybe one of his best tennis of his career at the moment." Thirteen matches down, one to go. Lukasz Kubot and Marcelo Melo stayed perfect on the grass on Thursday, ousting top seeds Henri Kontinen and John Peers 6-3, 6-7(4), 6-2, 4-6, 9-7 in the Wimbledon semi-finals. Melo/Kubot will now put their grass-court streak to the ultimate test: the Wimbledon doubles final. In Saturday's championship, the fourth seeds will meet 16th seeds Oliver Marach of Austria and Mate Pavic of Croatia, who outlasted Croatians Nikola Mektic and Franko Skugor 4-6, 7-5, 7-6(4), 3-6, 17-15 in four hours and 35 minutes. It will be a maiden Grand Slam final for both teams, but both Melo and Kubot have won Grand Slam titles with different partners. Melo, playing with Ivan Dodig, won the 2015 Roland Garros doubles title and reached the 2013 Wimbledon doubles title match. Kubot won the 2014 Australian Open doubles crown playing with Robert Lindstedt. Kubot/Melo, who joined forces full-time at the start of the season, have been nearly unstoppable since forming. On Saturday, they will go for their fifth tour-level title of the year after winning ATP World Tour Masters 1000 crowns in Miami (d. Monroe/Sock) and Madrid (d. Mahut/Roger-Vasselin) and picking up grass-court titles at the Ricoh Open (d. Klaasen/Ram) and the Gerry Weber Open in Halle (d. Zverev/Zverev). Marach and Pavic will be playing in their first Grand Slam final as a team and as individuals. But they also enjoyed grass-court success before The Championships. Marach/Pavic were finalists at the MercedesCup in Stuttgart (l. to Murray/Soares) and at the inaugural Antalya Open in Turkey (l. to Lindstedt/Qureshi). Regardless of Saturday's outcome, Melo will have a reason to celebrate. With current doubles No. 1 Kontinen out of Wimbledon, Melo will surpass him and return to No. 1 in the Emirates ATP Doubles Rankings on Monday when the new rankings are released. Melo, currently World No. 3, spent 26 weeks at No. 1 from November 2015 to June 2016. Distributed by www.Croatia.orgĂĂÂ This message is intended for Croatian Associations / Institutions and their Friends in Croatia and in the World. The opinions / articles expressed on this list do not reflect personal opinions of the moderator. If the reader of this message is not the intended recipient, please delete or destroy all copies of this communication and please, let us know! Or simply...enjoy and spread the word and good vibrations.